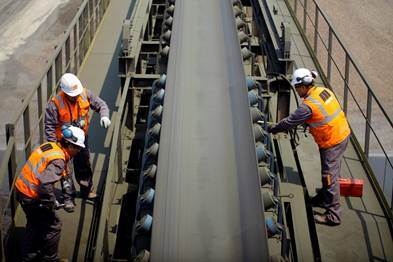 A global leader in bulk material handling technology is helping conveyor users reduce operating costs and improve safety with inspection and maintenance programs designed specifically for each individual system. The Walk the BeltTM program from Martin Engineering provides regularly-scheduled reviews of belts, cleaners, tracking, chutes, dust control and other components from experienced specialists with the training and expertise to maximize productivity and reduce downtime. Featuring immediate transfer of data and photos to facility managers, the program establishes an evolving record of each belt for current analysis and future reference. By taking responsibility for routine maintenance and identifying potential issues before components fail, technicians assist customers in maintaining system performance and extending service life, while minimizing fugitive material and unplanned shutdowns. Finding a Specialist – As plants across many industries struggle with staff reductions, some facilities now entrust some or all of their conveyor equipment installation and maintenance work to outside contractors. The approach keeps maintenance management in the hands of the plant, while outsourcing the actual labor. Fugitive material management is a key element of the inspection program, and one of Martin Engineering’s specialties. As problems from the creation, accumulation or escape of dust are multiplied by the increased possibility of regulatory citations, fines and shutdowns, it’s imperative that plants prevent the escape of fugitive particles. A key to minimizing the release of dust is the proper maintenance of components such as belt cleaners, transfer point seals, dust curtains, suppression systems and air cleaning equipment. Proper adjustment and timely service will minimize carryback and dust issues all along the conveyor. The Martin Engineering technicians do more than walk along the length of the belt, of course. In fact, one of their inspection techniques is standing stationary at a number of points along each conveyor and watching one or more complete revolutions of the belt, noting its condition, tracking, carryback and other observations. They take detailed notes, identifying trouble spots by component name and location as they are found, often logging data directly into a smart phone or tablet immediately at the site. Digital cameras and other devices allow the technicians to take photos, record video, make rough measurements and perform other tasks, then share a wealth of information with customer operations personnel for discussion and prioritizing. Maintenance and repair tasks can be included in the program and performed routinely, or scheduled upon request. Martin Engineering professionals can also provide a comprehensive survey of the entire plant’s material-handling system, including measured levels of respirable and fugitive dust and spillage. This report delivers grid-based results, giving the client real information that can be used to prioritize needs and avoid misplaced spending. “A conveyor is a complex system of interlinked components,” Strebel reminded. “If even one component or subsystem stops functioning, processes both upstream and downstream will be affected, potentially leading to a shutdown or worse. In a large facility, even a fraction of a percent of system availability could be measured in millions of dollars,” he added. Martin Engineering supplies bulk material handling technology and equipment around the world for a wide variety of applications, including mining and coal handling, cement/clinker, rock/aggregate, biomass and other materials. Founded in 1944, the firm is headquartered in Neponset, IL, offering manufacturing, sales and service from factory-owned business units in Brazil, China, France, Germany, Indonesia, Mexico, South Africa, Turkey, India, the UK, Japan, Russia, Peru and under exclusive license with ESS Australia.